You are here: Home / Arts / The Slipknot by TJ Dawe at the UVic Phoenix Alumni Festival October 18-22, 2016. A review. The years have not dulled the acuity or relevance of TJ Dawe’s narrative, The Slipknot, presented at the inaugural Phoenix “Spotlight on Alumni” in January 2003, and staged once again as part of the Alumni Festival to celebrate the Phoenix’s 50th anniversary. Dawe graduated from UVic in 1997 and quickly became a contender on the Canadian Fringe circuit—The Slipknot written in eight days in 2001 was his fourth play (and most widely purchased—allowing him some measure of financial security and freedom from the dead-end jobs it chronicles). Since that time, he’s gone on to become a minor god in the pantheon of performers, having created 15 original shows and appeared at over 100 fringe festivals from coast-to-coast. His dramatic monologues are the fruit of a sharp perceptive mind, in tune with life’s ironies—and never afraid to ask the questions most people don’t even think about. Benefitting from a natural facility with language (he’s never taken a creative writing course) and incredible auditory recall, Dawe remembers details when the average individual struggles to capture the big picture. The Slipknot is episodic in structure, the only props two mike stands with a couple of lights (overlaid with coloured gels) stage left and right. Dawe stands between them and begins to recount three entry level jobs—as merchandiser at Shopper’s Drug Mart when he moved to Toronto in 2000, as Trace Mail clerk at Canada Post in Vancouver three years earlier and driving construction bins (also in Vancouver) three years before that. How many people can list the first jobs they had, let alone the names of their co-workers and their vocal tics? Or the names of products, procedures, routes, routines and random facts. Despite being autobiographical in nature—at the talk-back after the show (which I encourage people to stay for) Dawe admits to some embellishment of his life stories, but also states that since 2004 all his scripts have simply recounted his life—The Slipknot contains enough universal elements to elevate it beyond self-involved and indulgent coming-of-age narratives. Whether it’s stocking shelves while musing that over three-quarters of the items in a drug store cater to women (and that it’s expensive to be a woman—a point he later expanded in Maxim and Cosmo) or recounting his first encounters with psychedelics, there are common threads that resonate with an audience—being the new person on the job, the gut-wrenching feeling of a big mistake, trying to make a long-distance relationship work, white-knuckling it on a crazy road trip. Dawe’s mastery of words is phenomenal and his ability to take them off the page and breathe life into the mundanities—incredible. Throughout he maintains an easy-going and relatable composure—as if he’s one of the gang, hanging out at the local watering hole telling tales, instead of one of Canada’s masters of the monologue and Fringe god—before shifting into overdrive to wrap up the threads of three disparate stories in a pulsating, rushing rhythm that demands complete attention. It’s a masterclass in the art of personal story—delivered by one of its best practitioners. Dawe appears often at the Victoria Fringe and Uno Fest. Don’t miss the next opportunity to hear him live. As well as writing, Dawe also directs and dramaturges work for others—he’s a long-time collaborator of fellow UVic alum Charlie Ross (One Man Star Wars, One Man Lord of the Rings and One Man Dark Night—also at the Alumni Festival), and recently directed alumna Nicolle Nattrass’ solo show Mamahood: Turn and Face the Strange. 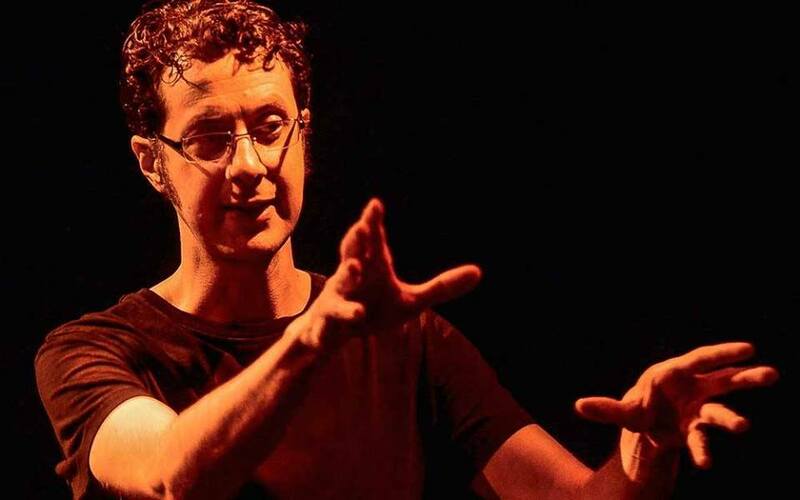 Playwright, director, and dramaturg TJ Dawe is also an international Fringe icon, regularly performing his 14 autobiographical solo shows around the world. His play Toothpaste & Cigars (written with alumnus Mike Rinaldi) inspired the movie The F Word. In The Slipknot, Dawe performs a spellbinding comic monologue about three equally lousy jobs – from stock boy, to driver, to post office customer service. In turns hysterical and heartbreaking, frantic and thoughtful, The Slipknot offers wise observations on relationships, Santa Claus, recreational Gravol, and why you should never put meat in the mail. A talk back session with the artist follows each show. The Alumni Festival continues October 25-29 with Shannan Calcutt in Burnt Tongue. Disclaimer: I received a complimentary ticket to attend The Slipknot.